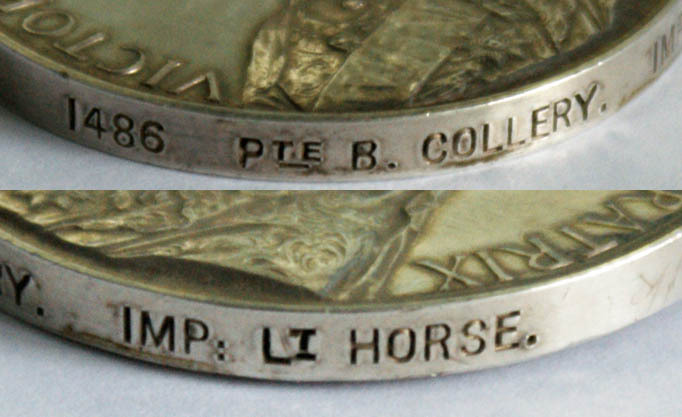 With regard to Bernard Collery's medal (not R Collery I now see! ), here is the naming and the rivetting. Some of the rivets no longer flex and, as can be seen from the SA01 clasp at the top, this had an SA02 clasp attached at one point. As Meurig pointed out, he was not entitled to the KSA (2) and there is no officail record of the SA01 clasp ever being issued to him. Still a very interesting recipient and a good addition to your collection. I think it is unusual that he has been identified as a 'Private' rather than a 'Trooper'. A very nice medal indeed. Well done. Also confirms his discharge on the 4th of July 1901.